The panelists were Aston Martin’s Global General Manager, Dr. Matthew Bennett; Hoerle-Guggenheim Gallery Chairman Philippe Guggenheim; Jet Lux CEO Tom Osovitzki; and Ulysse Nardin CEO Harmut Kraft. Aston Martin’s Dr. Bennett explained during the discussions how his designer seek inspiration from art and try to push the envelope of what is considered a car by taking new artistic approaches. 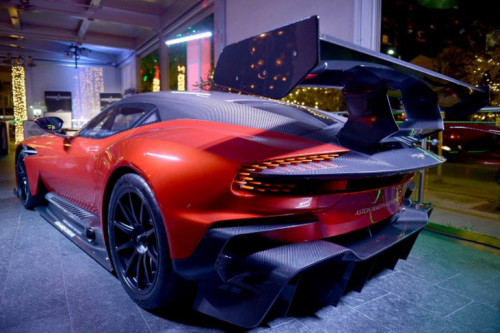 Aston Martin was one of the evening’s sponsors and they got to see the new Aston Martin Vulcan, a very exciting all carbon fiber, hand-built, $2.4 million dollar track-only super car, one of only eleven remaining in the world. Guests had the chance to listen to the discussion while dining at the downtown hotspot. Guests were served hors d’oeuvres including caviar and blinis and octopus before moving onto a seated, four-course dinner featuring buratta, prosciutto and melon, swordfish, shrimp risotto and Chilean sea bass and steak before sweets of snickers, tiramisu and gelato.